Only a week away the Food Network’s New York City Wine & Food Festival. The 5th year of this great festival has returned with its amazing line up of both legendary culinary icons from around the globe and America’s most beloved television chefs (Bobby Flay, Giada De Laurentiis, Mario Batali, Rachael Ray, Paula Deen and the list goes on and on). This will be a big talked about event around the world. I mean, to have the magic of NYC and to enjoy all the fabulous food and wine, what more in a festival could you ask for? Let’s not forget that this is all going to a special cause. 100% of the proceeds benefit the Food Bank For New York City, fighting hunger in the five boroughs; and Share Our Strength, a national nonprofit working to end childhood hunger in America. In 2011, the Festival raised more than $1.2 million for these charities, helping them better provide for those they serve and closing the gap on hunger in our country. To find out more about these great organizations visit them at http://foodbanknyc.org and http://www.strength.org. So when purchasing your tickets just remember that you will be helping a family or child out. 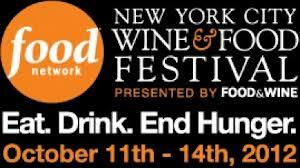 To find out more about the Festival and to purchase tickets please visit http://nycwff.org. I don’t think you will be disappointed. I hope to share more on this event with you. Tickets are selling out quick so make sure to purchase your event tickets today.